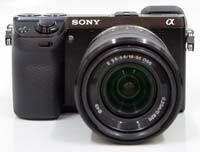 The Sony NEX-7 is a new compact system camera, the fifth model in the NEX series, that's aimed squarely at enthusiasts. Featuring the same 24.3 megapixel Exmor APS HD CMOS sensor as the A77 and A65 SLT cameras, the NEX-7 has an eye-level XGA OLED electronic viewfinder, 25-point contrast-detect autofocus system, 1200-zone evaluative metering, 3-inch tilting LCD panel with 921,000-dot resolution, an ISO range of 100-16000 and a shutter release lag of just 0.02 seconds. The magnesium bodied NEX-7 can also capture fast-moving action at 10fps at full resolution, shoot Full HD 1920 x1080p video as high-quality AVCHD files at either 50fps or 25fps, and has an Auto-lock Accessory Shoe that supports various accessories including external flashguns and a clip-on LCD monitor. 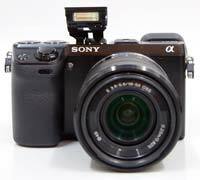 Lenses can be fitted via the E mount system, and the NEX cameras can also use regular Sony Alpha lenses via the optional LA-EA2 adapter. The NEX-7 is available body-only for £1000 / $1200 or as a kit with the Sony E 18-55mm zoom lens for £1100 / $1350. The Sony NEX-7's rectangular, sharp-edged body, chunky rubberised hand-grip and large APS-C metal lens mount combine to create a futuristic camera that's very different in style to the likes of the Olympus PEN and Panasonic GX-series. With the supplied 18-55mm kit lens attached the NEX-7 looks and feels a little top heavy, and that's without fitting an existing Alpha DSLR lens proper, compatibility offered with pre-existing optics via the LA-EA2 accessory adapter which allows phase-detection AF with almost all A-mount lenses. The NEX-7 undoubtedly feels solid when gripped in the palm, though with the supplied lens attached it's too big for most jacket pockets, something which the recently-reviewed Panasonic Lumix DMC-GX1 overcomes with its clever pancake-sized 14-42mm power zoom lens. The NEX-7 isn't the world's smallest and lightest interchangeable lens camera, but weighing 291g and measuring 42.6mm in depth if not counting its grip or lens mount, it's hardly a heavy or large model, perfectly at home in a small camera bag. The NEX-7's 3-inch LCD screen can be tilted back and forward - if not, unfortunately swung outwards at 90° - to allow for low and high angle compositions we might not have attempted without. 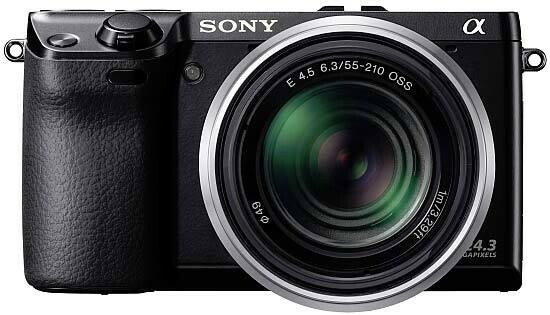 Sony has included High Definition video shooting at Full HD 1080p at 50fps or 25fps with stereo sound and the very welcome ability to control the shutter speed, aperture and exposure compensation during recording, plus either continuous or manual focusing. The NEX-7 also features a small, dedicated red camcorder-style video record button for instant thumb-operated video access, which is useful, while Tracking Focus allows a target object to be selected and automatically followed even when the subject is moving, for both stills and video. Like Panasonic's directly competing GX1 (and unlike the Olympus Pens) there's no in-body image stabilisation offered by the NEX-7 unfortunately, so this is via lens only, the optically stabilized 18-55mm zoom that we reviewed the NEX-7 with offered as part of a kit deal. Though we did see occasional softness, the image stabilisation system appears to work well - at least as effectively as the in-camera or lens-based anti shake methodologies deployed by rival brands. Sony branding and DSLR-style lens release button aside, all we find on the faceplate is a small porthole-shaped window for the AF assist/self timer lamp, twin holes for the left and right (stereo in combination) microphone, each sitting either side of the lens mount, an infra-red receiver for the optional remote, a rectangular CR3 battery-sized and shaped handgrip with a rubberised surface for a firmer hold, plus the shutter release button on the forward-sloping edge at its top. Alongside the shutter release is the first of several buttons that can be customised to suit your particular way of working, this Function button by default providing access to the focus, creative style, D-range and white balance settings. The NEX-7 is turned on or off via a flick of a nicely rigid switch surrounding the shutter release button, rather than via the recessed button we usually find on cameras with a smaller form factor. Do this and it's a wait of less than a second before an image materializes on the LCD allowing the first shot to be framed, a match for most DSLRs proper. 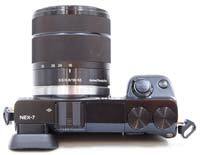 The NEX-7's top plate marks the biggest departure from the other NEX cameras that Sony have released so far. Viewed from the rear and starting from the left, there's an Accessory Shoe that supports various accessories including external flashguns and a clip-on LCD monitor, a built-in pop-up flash with a clever hinged design that lifts it high above the lens to help avoid redeye, and two unmarked control dials that are recessed almost completely into the top-plate. Depending upon which shooting mode you're using, these dials control the aperture, shutter speed and exposure compensation. Although we'd prefer the combination of one fore-finger operated dial and one thumb operated dial, which allows you to more easily and quickly set the aperture and shutter speed together in the Manual shooting mode, having two control dials is something that most DSLRs don't offer, never mind a compact system camera, and is just one of the things that marks the NEX-7 out as a serious camera. Press the shutter release button down halfway and, after a blink-and-you'll-miss-it moment of focus/exposure adjustment, the AF point/s highlight in green accompanied by an optional beep of affirmation to indicate that the user is good to continue on and take the shot. While the NEX-7 is quick and reliable in good lighting conditions, in low-light it does take longer to lock onto the subject and sometimes misses altogether of frustratingly hunts around - the Olympus E-P3 and Panasonic DMC-GX1 definitely have the edge in this department. In single shot mode and to the sound of a satisfyingly brief shutter click thanks to a release time lag of just 0.02 seconds, a full resolution JPEG is written to memory in about 2 seconds. As you'd expect in this price bracket, there is the option to also shoot Raw files, or even more usefully for those who wish to hedge their bets Raw and JPEG images in tandem. These settings are accessed within the Image Size folder and are found within the Quality sub folder. You also get Fine or Normal compression levels offered for JPEGs. 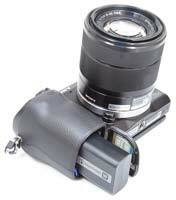 As with previous NEX models, not everything on the NEX-7 is located exactly where you might expect it to be found. For example ISO settings are discovered within a Brightness menu option that from the look of the icon that denotes it initially appears to be for adjusting screen brightness only. One would reasonably expect ISO adjustment to be found within the Camera folder with the other key shooting options. And so there's a fair amount of familiarisation with the NEX-7's quirks required up front. Shoot mode gets its own virtual dial in the main menu though - so at least selecting the options here, including standard P,A,S,M, 9-strong scene mode, Anti Motion Blur, Intelligent Auto, Sweep Panorama and 3D Sweep Panorama, prove easier. Even in intelligent auto mode users still have the ability to get hands on to a degree by controlling background defocus, with a half moon shaped indicator appearing on-screen to the side of the scroll wheel, defocus at the bottom of the arc, 'crisp' at the top. There are further controls for Brightness, Color, Vividness and Picture Effects, all part of the so-called Photo Creativity Touch interface. The NEX-7's external backplate is a similarly pared-down affair, the majority of it taken up by the 3-inch widescreen ratio angle-adjustable LCD that stretches from the base to the top plate. The NEX-7 offers switchable framing lines and a level gauge display in both the LCD screen and the viewfinder, helping you to compose your image and keep horizons straight. The NEX-7 also has a clever eye level sensor that switches off the rear screen's info display as you bring your eye close to the excellent viewfinder, plus a facility that automatically flips the same display through 90° should you turn the camera on its side to shoot in portrait fashion. Above this is one of the NEX-7's main advantages over its principal rivals, a high-resolution XGA OLED electronic viewfinder. Offering 100% scene coverage, a bright, high contrast image and a wide angle of view, the NEX-7's EVF also displays virtually all of the camera settings and menus that you can also control via the rear LCD screen, as well as the same preview of the scene according to the current settings. The EVF is so good that we used it for the majority of our shooting in both good light and bad, a real testament to its quality. For us the built-in EVF is one of the main attractions of the NEX-7 when judging it against the compact system camera competition. Above the screen are dedicated buttons for releasing the pop-up flash and image playback/review, and top-right are a switch/button combination for toggling between AF/MF and AEL and the small but useful dedicated movie record button. Press this and the user is instantly recording video, whatever alternative shooting mode might previously have been in use; like the same control found on latter Panasonic G-series and Olympus PEN cameras, this proves essential with regard to spur of the moment filming. users will find separate covered ports for HDMI connectivity, USB output and an external MIC. Only the USB cable was provided with our review sample; there's no standard definition AV output. To the right of the LCD screen is a trio of controls - the top and bottom buttons are unmarked until the screen is activated, at which point their purpose is detailed alongside it. The top-most control is revealed as the 'menu' button, a press of which brings up the shooting icons - six in total - the contents of we've already briefly touched on. Instead of the screen-full of text you might expect to be presented with upon a press of the menu control, from top left to bottom right of screen, presented instead are Shoot Mode, Camera, Image Size, Brightness/Colour, Playback and Setup icons. The user moves through these options and makes selections either via the scroll wheel just below the menu button, which has its own central (and again unmarked) set button. This wheel is quite responsive to the touch, which, on a positive note, means that tabbing through options is a swift process, but on the other hand it's easy to slip past the setting you actually wanted when hurrying through them as a photo opportunity suddenly presents itself. The scroll wheel also doubles up by default as the most immediate way to change the ISO speed. Used in conjunction with the two control dials on top of the camera, it's remarkably easy to change the three main exposure controls. By default the central button opens the shooting mode dial, but it can also be reconfigured to access the new Custom screen, which by default contains the ISO, white balance, flash, creative style and image size options. Once again this button can be customised, just one of 5 external controls that can be configured to your specific needs. 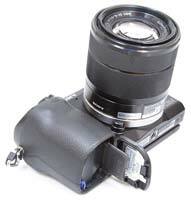 Set at three points around this scroll wheel/pad are a means of adjusting the display, exposure compensation (+/- 2EV selectable), and drive mode (single shot, continuous, continuous with speed priority, so focus/exposure fixed from the first shot), or self timer option (2 or 10 seconds). There's also options to enable the camera to be utilized with the aid of a remote - sold separately of course - and a bracketing control for exposure. By default pressing right on the scroll wheel accessed the various flash modes. The flash options more unusually include rear sync as well as slow sync, plus the regulars of auto and fill in. Somewhat confusingly the NEX-7's red eye reduction setting isn't also found here - instead it has to be first enabled via the aforementioned Setup folder if you're shooting portraits with flash. The bottom button on the camera back provides by default a means of setting the focus type, with three options on offer - Multi, Center and Flexible Spot - and then setting the actual focus point if the latter option is selected. At the base of the camera we find a screw thread for a tripod directly beneath the lens mount, and, in the nether regions of the grip, a compartment storing both the rechargeable battery and optional memory card - here Sony reaching out to a wider audience by offering SD/SDHC/SDXC compatibility alongside its own Memory Stick. While the right hand side of the NEX-5N - if viewing it from the back - features a continuation of the ridged grip but is otherwise devoid of ports or controls, the left hand flank is where users will find separate covered ports for HDMI connectivity, external microphone and USB output. Only the USB cable was provided with our review sample; there's no standard definition AV output.